No Italian city’s culinary offerings can be summed up in three dishes – believe me, I know this. But when travelers have only a limited amount of time to visit, it’s important to make sure the absolutely-can-not-miss dishes are at the tippy-top of your dining priority list. This, therefore, is my attempt to guide you toward the quintessential dishes of Venice. I am, obviously, leaving out a million amazing things to eat in Venice. Fegato alla veneziana (liver and onions) is a local favorite. The little moleche crabs are a seasonal delicacy. And anyone visiting during Carnevale shouldn’t miss the fritole. I’m leaving plenty of deliciousness out, but eating in Italy is like sightseeing in Italy – you can’t do it all in one trip. With this list of three things you must try in Venice, at least you’ll be well on your way to having three memorable culinary moments during your stay in Venice. Learn more about so-called “Italian food” as well as what to do in Venice while you’re at it, too. Venice has a reputation for mediocre and expensive food. To an extent, this is easy to understand. A city as famous and popular as Venice will attract tourists by the millions every year, no matter the quality of the food. So many of those visitors are day trippers who haven’t done their homework, so they might stop at the first place advertising pizza. When it’s only so-so, they might assume that Venetian food is no good. They’re wrong, but I’ll give them this – Venice sometimes makes you work a little harder to find high-quality food. Getting away from the busiest tourist avenues is a great start to finding great restaurants in Venice. Knowing what dishes and ingredients are local and seasonal favorites in this part of Italy is another key to eating well in the canal city. These are good tips no matter where you go in Italy, and they’re especially important in Venice. Eating cicchetti in Venice is really a style of eating, not a particular dish. “Cicchetti” are small bites – you might call them appetizers – of what are often local specialties. Stopping at a bacaro (a cicchetti bar) in Venice in the late afternoon or early evening, between the work day and the dinner hour, for a plate of bite-sized morsels paired with a small glass of wine is a Venetian tradition. Now, as is the case with aperitivo in cities like Milan or Rome, you aren’t likely to make a full meal out of cicchetti at one bar. You are encouraged, however, to visit a few bacari to get your fill of cicchetti as you venture on a bit of a dinnertime walking tour of Venice. Before you choose a bacaro, take a peek at the cicchetti on offer. Some bars will have a selection of fried goodies and little sandwiches. Others will have artistically-designed finger foods. You’ll just need to point at each item you want and indicate how many you’d like – this can be especially fun if you’re not particular about what’s in each one (and don’t have any dietary restrictions). Order a beverage, pay at the counter (this is most typical), and then find a spot at a table or a place to stand at the counter. Your chosen cicchetti will be delivered on a plate with your drink. polenta – Polenta comes in many forms in Venice and elsewhere. It’s often served in its creamy form as the bed for a main course. But when it comes to cicchetti, polenta is cooked, cooled, cut into small pieces, and grilled. The sturdy pieces of polenta can then take the place of crostini. sarde in saor – Venice is on a lagoon, so seafood is a big deal. Sarde are sardines, and sarde in saor are sardine fillets that have been fried and then marinated in vinegar sweetened by raisins, pine nuts, and onions. The sweet and sour dish is a common antipasto. baccalà mantecato – Dried salt cod is reconstituted and then mixed with olive oil and some seasoning. The rich mousse-like finished product can be served on crostini or pieces of polenta. And you don’t need to spend a fortune to sit at Harry’s Bar to order a Bellini in Venice, either, though more typical cicchetti beverages are a simple glass of Veneto wine (feeling festive? Order prosecco!) or a Spritz. There are many varieties of risotto found on menus in Venice (rice being a regional staple), and several that include seafood that comes right out of the lagoon. 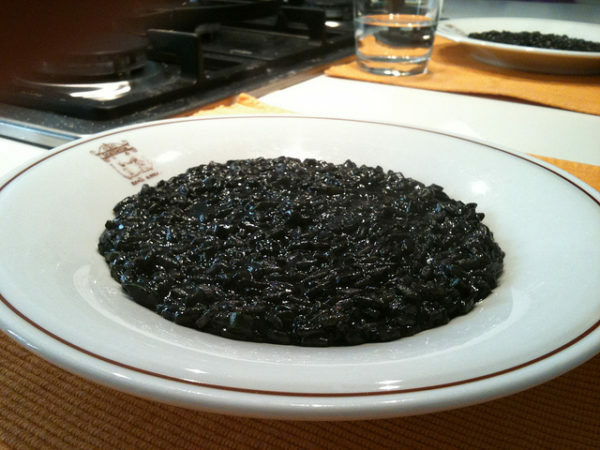 None is quite the visual stunner that risotto al nero di seppia is, however. Why? Because it’s black. And that’s not usually something you expect from rice. Seppia is squid or cuttlefish, which – as you might recall from high school biology classes – have a defense mechanism that involves ink. With risotto al nero di seppia, that flavorful ink is used to make risotto taste even more like the sea, and it turns the whole dish a black color to boot. Along with the ink, the risotto is cooked with pieces of squid and, usually, onions, wine, and tomatoes. The end result tastes of the sea, and is a rich meal that satisfies on a chilly Venetian night. The fact that it may turn your teeth purple is just an added bonus. Another rice-based dish that’s popular in Venice (and is far less showy than risotto al nero di seppia) is risi e bisi. In the Venetian dialect, the name translates as “rice and peas,” and that’s basically what this dish is. It’s Venetian comfort food that has its roots in cucina povera, or “peasant cooking.” And yet? It was the traditional dish served to the Venetian Doge by the peasants who lived on the outlying islands in the lagoon, so despite its cucina povera roots, risi e bisi was simultaneously good enough for the highest nobility in the Republic. 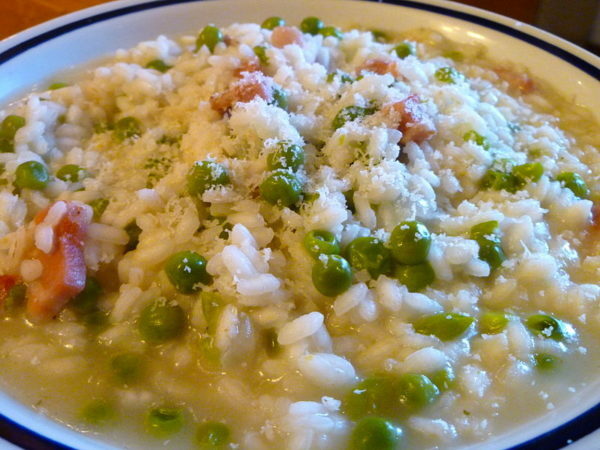 Risi e bisi is a mix of rice with fresh peas, onion, pancetta, and grated cheese. It’s a springtime dish, and it’s not really risotto, though the rice is cooked with the other ingredients. To give the dish added pea flavor, some restaurants actually cook the shells from which the peas come in water to make a tasty broth that then goes into the dish. Okay, now it’s your turn! Tell me, what three things would be on your must-eat list in Venice? 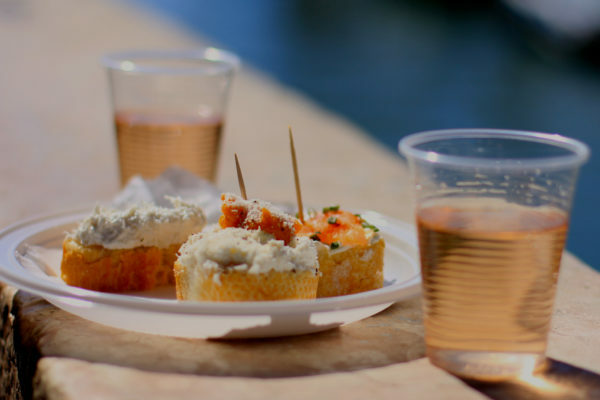 What three things are you most excited about tasting when you go to Venice? Bigoli in salsa is a beloved signature Venetian dish. A special spaghetti-like pasta, of a light brown color as it’s made from a whole wheat grain. The pasta is sauced with a mix of onion and salt cured fish, usually anchovies, but traditionally sardines were also used. Of course some places make it better than others. Many just use spaghetti, but I like the dish as it’s made at Osteria Antiche Carampane, with a thinner pasta that seems to me more authentic, and richly flavored to balance the salt, onion sour/sweet flavors. The osteria has a very warm ambience, nicely nestled into a confluence of narrow streets about 15 meters from a small canal. That sounds delicious, Will! Thanks for sharing. I still say Veneto is somewhat lacking in cuisine compared to other more legendary regions of Italy (admittedly, matching Tuscany or Umbria is a high bar to clear). I belong to several FB groups that regularly feature recipes from Veneto and Venice; it sure seems there is an awful lot of frying going on! I will be sure to try risi e bisi when I am there next! Thanks. Risotto di Zucca, pumpkin risotto, Branzino al sale (seabass cooked in salt crust), Pasta e Fasioi (Bean Soup), Seppie in umido (cuttlefish in tomato sauce)….. shall I go on. To be honest I am Venetian and i rarely fry food. Venetian cuisine is about using very fresh ingredients, herbs and fast cooking. The deep fried things you see is those which we cooked for special occasion. But on a regular basis any Venetian will have risottos, polenta with anything, pasta with fish or meats or vegetables, cheeses and cold cuts! Well, now I’m hungry, Monica! 🙂 Thanks for chiming in, I know I can always count on you for Venice insights. Venice takes work. And she’s worth it.